Following is a media release issued by the Victorian Cancer Council. People who falsely promote and provide unethical, fraudulent and potentially dangerous treatment for cancer are the focus of three significant documents launched by the Cancer Council today. 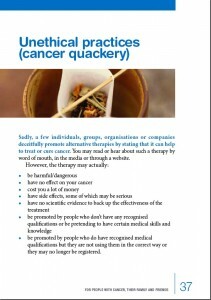 A book titled ‘Complementary and alternate cancer therapies‘, a fact sheet to help patients and their families make decisions about therapies and another fact sheet for medical professionals with tips on how to help patients avoid such practices has been produced with funding from the State Government of Victoria, Department of Human Services. ‘Many people with cancer use some sort of complementary therapies for legitimate reasons such as maintaining hope and staying in control of their situation,” Dr Amanda Hordern, Deputy Director of the Cancer Information and Support Service said. “Health professionals are the best people to help people make a safe treatment choice so we have gone to great lengths to publish some guidelines to assist them with this. “Targeting sick people with unproven alternative therapies can be fraudulent and may have a huge effect emotionally, physically and financially on the person with cancer and their family. “The new information has been developed to help people recognise which therapies may be helpful and which may be making false claims. This is an important aspect with many complementary and alternative therapies proving to be a risk for some cancer patients,” Dr Hordern said. Associate Professor Michael Jefford, Clinical Consultant to the Cancer Council said people usually used these treatments hoping to get better. “People are hoping to shrink or even cure their cancer, deal with side effects, or just improve how they’re feeling,” Associate Professor Jefford said. “Sadly, people with cancer rarely discuss the use of complementary and alternative cancer therapies with their cancer specialist. “Doctors are particularly concerned if people use unproven, alternative treatments instead of standard treatment options. They need to discuss all options with their doctor and then make an informed decision on alternative therapies,” he said. “A major worry is when people with curable cancers don’t get the treatments that could cure their disease. “It’s about access for patients to the right information and ensuring that they come to the best possible decision that will give them the best possible chance of dealing with their illness. “Cancer Council Victoria has developed some really good information about these treatments. 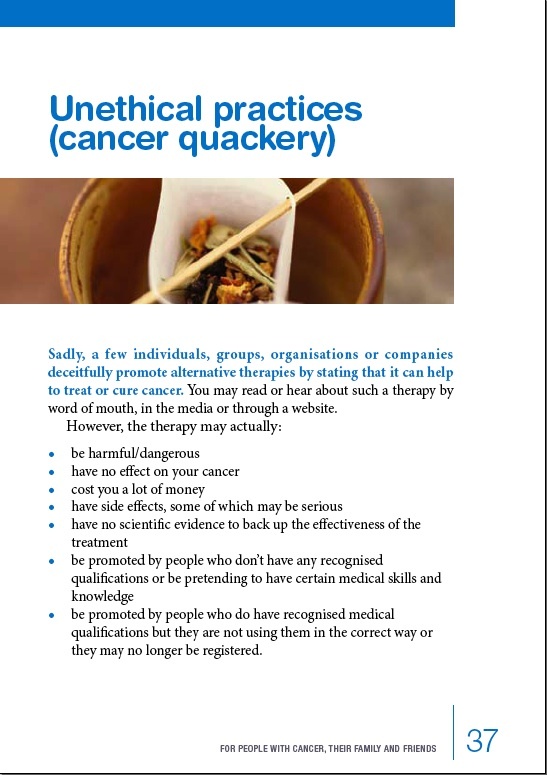 “The Cancer Council Helpline has easy access to information about a lot of complementary and alternative medicines. Also, the Cancer Council is training health professionals to talk about complementary and alternative medicines with their patients,” he said. Cancer Council Victoria keeps statistics on all cancers in Victoria and over the past 20 years survival rates have increased year on year. Detailed stats can be found at www.cancervic.org.au. The booklet and fact sheets are available free, through the Cancer Council Helpline, 13 11 20, and are also available online. To interview Dr Amanda Hordern or Associate Professor Michael Jefford please contact Tim Coghlan on 9635 5262 or 0431 150 365. 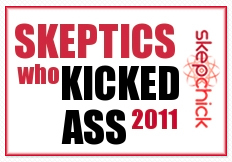 I have previously blogged about cancer quackery here.